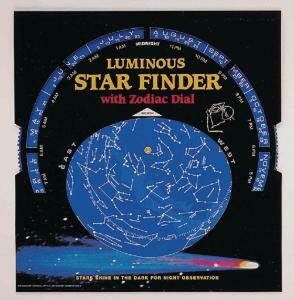 The major stars on this easy-to-use chart are printed in luminous ink; simply set the date and hour on the finder to view the position of the stars at any time, then take it outside to help you locate them in the sky. It shows constellations, stars to the fifth magnitude, nebulae, and the Milky Way and is printed on heavy cardboard with a markable/erasable plastic surface. Instructions and planet location tables are printed on the back cover. Size: 10 3/4" x 11 1/2".